Ruth had her first full spina bifida clinic yesterday. She met with an Occupational Therapist, Physical Therapist, Dietitian, and the main clinic doctor and nurse practitioner. It was mostly "meet the staff" visit, and updates on any changes. The physical therapist and occupational therapist gave me some things to work with her at home. Mostly the same stuff as before, tummy time, looking at toys. She also suggested I sit her up (like in the corner of a couch), to help develop some of those muscles. She performed well for both therapists, even smiling at one of them. The dietitian talked about baby foods, what to look for to prevent some of the bowel problems common in spina bifida kids. She said to skip rice cereal, and start with a whole grain. And for the jar variety, look for ones high in fiber. We met with the other clinic doctor, she was very nice. She said her eyes looked nice and straight (it is common with SB kids to have one eye turn in a bit). Asked a lot of questions, we had mostly good answers. We talked about what to look for with problems with her hydrocephalus, since she does not have a vp shunt, and has not met with the neurosurgeon since leaving San Francisco. Right now, she thinks she looks great, so we just need to watch for changes. 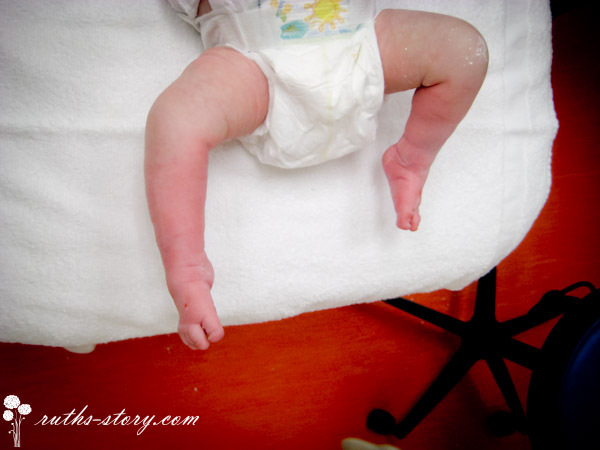 We then headed over to Orthopedics to get her next set of casts for correcting her clubfoot. First they cut off her casts. He nicked the tops of both her feet, poor baby. It wasn't a deep cut or anything, but it made me sad. As the orthopedist put it, "It's a big deal to Moms." In other words, we are the only ones really bothered by that. Her poor toes were all swollen, and her calves were red and black and blue. He told me that was common. He also said to one of the nurses "That's a lot of correction for one week! ", but when I asked him more about how many casts she would need, his answer was "I have no idea. Maybe 3-4, give or take 1. So, anywhere from 2 to 5.". I get the feeling that is the answer he gives all parents. I also asked about the heel cord cutting surgery, if he thought she would need it. He said that almost all need it, but "Never say never, and never say always". I get the feeling this doctor is used to dealing with parents! I liked him. I thought I came prepared this time with a bottle to distract her, since she's not a fan of pacifiers. Well, for about the first 1-2 minutes, it worked. After that, she just wanted held. She cried the remainder of the time. Breaks my heart. We go back next Tuesday for her next set of casts. Hopefully she will not need too many more! Wow! They look so good after just one week. 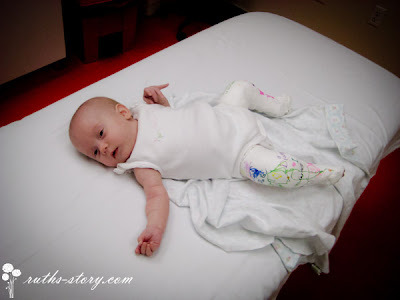 Poor baby...but her sisters have a new set of casts to decorate! You're one tough lady, Sara. Stay strong! Her feet are looking great! What a darling little pumpkin! God sure picked the right parents for Ruth. My heart goes out to all 3 of you. She sure is a precious bundle. Thanks Sara for keeping me up to date. Mom and I talk about little Ruth all the time. I sure enjoy seeing pictures of her.